Over on The Wire, Edwin Pouncey hears how Chicago's alt.Country stars cracked the cocoon of success to release the free spirits within. But with each Wilco album they seem to be tracing a deliberate trajectory toward what might be called, and has been called here, the avant guarde, but I can tell you from my experience, most of my friends who are heavily in to avant guarde art whether John Cage, Duchamp, Cecil Taylor, or whomever, do not find Wilco's forays to be avant guard at all, I don't know, maybe they think a few noise tracks are a half-hearted commitment to breaking the mold of acceptable(ed) culture. I do not agree with them, I have loved each album. 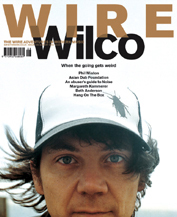 I just wonder if Wilco will take a similar path to Young's, making acoustic/folkish albums as well as sound experiments, or if they are indeed on a developmental arc toward challenging weirdness which could also be cool. I'm open, but if the latter is the case, there might be a time when they're too avant for their fan base and not avant enough to catch the real cultural rebels, just a thought.